Mountaineering Scotland was recently contacted by members concerned by the placement of bolts on the main cliff at Diabaig, on the coast near Torridon, asking what our position is regarding this action. Now we're consulting with climbers to ascertain opinion on the matter. 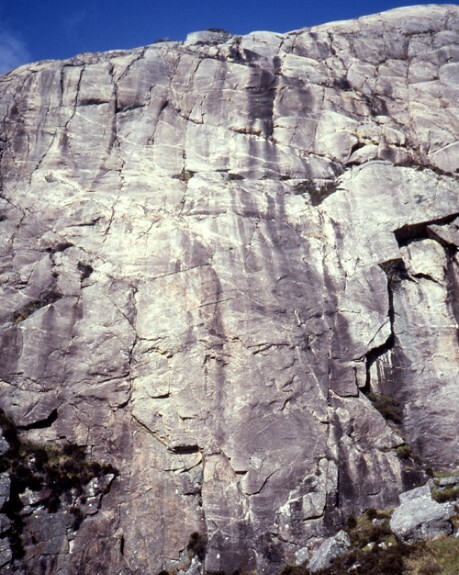 Diabaig is an accessible, documented, low-level crag in the north-west Highlands, near Torridon. The situation is that existing in situ trad anchors for abseiling were removed and bolt belay stations were placed instead. We understand the bolts used are new Petzl Coeur 12mm expansion bolts with Petzl hangers, steel maillons and stainless steel abseil rings. We have considered this issue with reference to the �Climbing in Scotland Statement 2013� which includes advice regarding bolting and best practice. This statement was widely consulted upon in the climbing community, prior to adoption by the MCofS Board in 2013. In considering the action taken at Diabaig against these points, the current position statement would not support the installation of bolts on the cliff. As Diabaig is an existing documented trad venue, with a wild character, and the bolting was undertaken without any prior consultation with the climbing community the installation of bolts, for whatever purpose, would be considered unacceptable. Consideration should also be given to the need for the replacement of the old in-situ protection. The current policy encourages a �pure ascent� of a climb without in-situ protection. We consider this to be a recommended ethic in adventure climbing which is reflected in the current statement. Abseil points are part and parcel of this and although they may be justified if there is a safety issue in descending, the case for this has not been made at Diabaig. Mountaineering Scotland strives to represent the climbing community�s views rather than prescribe their climbing activities and we work to facilitate where we can, offering guidelines for climbers to subscribe to. These guidelines allow climbers to make informed decisions about our sport and allow the climbing world to self-regulate and we understand that there will be a range of differing opinions on this issue. We can offer assistance to aid consultation and, in this case, we can provide a means for consultation through our communications channels, with the offer of a short SurveyMonkey poll on whether climbers support the actions at Diabaig. We can then collate a collective response and advise on the community�s views. The main cliff at Diabaig. Photo by Kev Howett.